Unable to refute an idea with critical analysis? Difficulty confronting fundamental realities that change your world view? Having trouble articulating a position that successfully refutes an idea you aren’t comfortable with? No problem. Simply sprinkle a dash of conspiracy bait over the issue and viola! You have made the problem go away with a generous application of our blanket dismissal powder. Never again will media flunkies ever have to address disparities between official statements and what pesky evidence otherwise suggests. And if you act now, get a special blender designed to mix rotten apples with clean oranges. Never be afraid to lump the most outlandish and discredited positions with those darn contradictions backed by so much evidence! Act now! And as we were first told back in 2003, attacking Iraq for those most elusive WMD’s costs a mere eighty seven billion dollars. Last Summer, as the push for intervention of Syria intensified, the United States Department of Justice requested that George W. Bush, Richard Cheney, Donald Rumsfeld, Colin Powell, Condoleezza Rice and Paul Wolfowitz be granted immunity for war crimes in Iraq. Imagine our surprise in 2007, when we discovered how a newly elected so-called progressive house refused to impeach these same characters for pretty much the same thing. Betrayed by the phony left/right paradigm. Beyond the despair and sadness caused by 9/11 and it’s exploitation to date, current events will continue to reference 9/11 as a central historic event affecting our predicament. We can follow the truth to help dig our way out of this tyrannical quagmire or let the lies bury us all. Post has been removed by request of the author. Russia’s Foreign Minister Sergey Lavrov stressed that “political games” prevented Russia from investigating the data on the use of toxic substances in Aleppo: the UN Secretariat couldn’t respond promptly to Moscow’s demand to look into the matter. Several countries, including Israel, the UK, France and the US – all vocal critics of Syrian President Bashar Assad – all claimed they had evidence that chemical weapons were used in Syria. 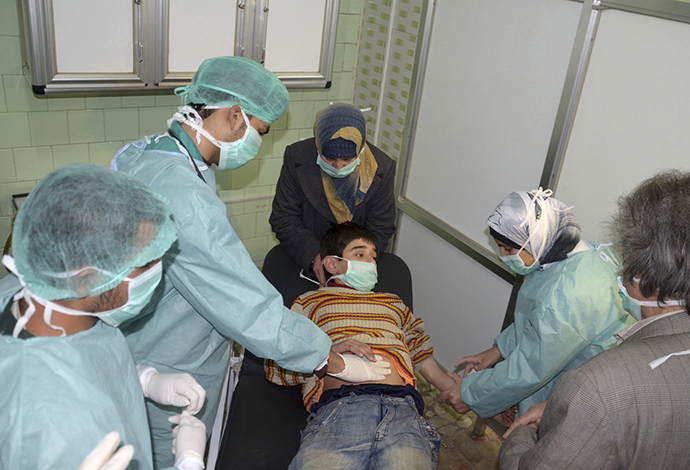 Damascus denied that a chemical attack was carried out by the Syrian army, blaming the rebels and Turkey for the incident: “The rocket came from a placed controlled by the terrorist and which is located close to the Turkish territory. One can assume that the weapon came from Turkey,” Syrian Information Minister Omran al-Zoabi alleged in an interview with Interfax news agency. Lavrov spoke following the reports that Turkish security forces found a 2kg cylinder with sarin gas after searching the homes of Syrian militants from the Al-Qaeda linked Al-Nusra Front who were previously detained. The sarin gas was found in the homes of alleged Syrian militants, who were reportedly planning a terrorist attack on the southern Turkish city of Adana. Russia expressed concern over the incident, urging for a thorough investigation into the matter. Almost a month ago, the Syrian Deputy Foreign Minister Faisal Muqdad said that Damascus was ready to have the UN investigation team look into alleged chemical weapons use in Syria. “We were ready and we are always ready, right now, to receive the delegation that was set up by [UN Secretary-General] Ban Ki-moon to investigate what happened in Khan al-Assal,” Muqdad said, referring to the March 19 incident near Aleppo. Syrian rebels are accused of using a rocket with a chemical warhead, killing 25 people and injuring 86, according to SANA news agency. Meanwhile, the US and Germany spoke to Russia on the perils of sending Assad any sort of support, arguing it would prolong the war and jeopardize efforts to bring the warring parties to the negotiating table. US Secretary of State John Kerry, with his German counterpart Guide Westervelle, urged Russia not to supply Assad with its sophisticated S-300 air defense missile system – among other reasons, arguing that it would threaten Israel’s security. Westervelle called the decision “totally wrong”. Kerry has been actively promoting the upcoming Geneva conference on Syria, having met with Lavrov earlier – although planning has been muddled by the opposition threatening to boycott the talks. Despite this, Western powers have repeatedly chosen to overlook the opposition’s actions as an obstacle. The Syrian civil war has been raging for more than two years now, with more than 80,000 people killed, according to UN estimates. In his latest statement on the matter, Lavrov noted the Russian government’s concern over the issue due to the chance of provocations around the situation. IRAN has dismantled a “terror network” backed by Israel’s Mossad intelligence services which planned to disrupt the upcoming presidential election in the Islamic republic, the state broadcaster says. “The intelligence ministry has identified and arrested the members of this terror network, and confiscated their weapons,” IRIB said on its website on Sunday, quoting a statement by the ministry. It said the arrested group was made up of 12 members, but did not say when it had been busted. The ministry neither identified any of those arrested nor mentioned their nationality, but said the cell leader originated from an unnamed “regional Arab” country. On June 14, Iran is to hold its first presidential election since massive street protests, stifled by a brutal state crackdown, marred the disputed re-election of Mahmoud Ahmadinejad in 2009. Iran accuses its arch foes Israel and the United States of waging a deadly campaign of sabotage against its disputed nuclear program, announcing from time to time the arrest of suspected Israeli or US spies, but provides little or no public evidence supporting the accusations. The statement on Sunday said the group had been instructed “to conduct terrorist acts ahead of, and in particular, on election day” as well as “creating ethnic and religious divisions” in restive areas of Iran. It said the group had already “hit several targets in a town,” and that “its main culprit was in contact with a headquarters in Britain”. It did not elaborate. Last month the Islamic republic said it had hanged two convicted spies, one found guilty of working for Israel, and the other for the Central Intelligence Agency (CIA). A high-ranking Mexican drug cartel operative currently in U.S. custody is making startling allegations that the failed federal gun-walking operation known as “Fast and Furious” isn’t what you think it is. It wasn’t about tracking guns, it was about supplying them — all part of an elaborate agreement between the U.S. government and Mexico’s powerful Sinaloa Cartel to take down rival cartels. The explosive allegations are being made by Jesus Vicente Zambada-Niebla, known as the Sinaloa Cartel’s “logistics coordinator.” He was extradited to the Chicago last year to face federal drug charges.